WASHINGTON -- Middle school teacher Yvonne Mason thought she was prepared for anything in her classroom. The day was overwhelming, recalled Mason, who has taught at several middle and high schools in Greenville, S.C. While she calmed down her students, she also had to trust teachers a few miles away to guide her own daughter through the chaotic day. "I watched the second tower live in my classroom," Mason said. "I'm glad I didn't have it on when the kids were there. Then I had a class come in. One of my students had a father who is a private pilot for a large corporation who was in the air on his way to New York." The events of 9/11 occurred while most children were in their Tuesday morning classes, forcing teachers to become the first responders in translating the attacks to their students. For some, it was a defining moment -- Mason realized she was more than a teacher. "We are surrogate parents for the time that we have them during the day," she said. "They asked, 'What happened? Are we in a war? Who would do this?'" Mason said she remembers thinking, "I have to make this as calm as I can. I want them to stay here in a framework of normalcy." While Mason dealt with middle schoolers, other teachers who had younger, more impressionable students, had to make quick judgement calls about what to tell their classes. 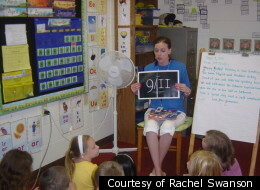 Rachel Swanson was student-teaching kindergarten at the time, and said most people in her school were in disbelief. Swanson, more than a thousand miles away from New York in Superior, Wis., said it felt bizarre, as if it wasn't actually happening. The teachers decided not to say anything to the kindergartners because they felt it wasn't their place to do so. They waited instead for the children to bring it up, Swanson said. "As a teacher you don’t get caught up in a moment, the moment is in front of you -- 20 some blank faces staring at you, and you question your role and responsibility as a teacher," said Cassandra Allara, a seventh-grade teacher from Kanawha County, W.Va. Allara turned on the TV just in time to see the second tower fall, and while she tried to process it herself, she had to explain the events to her class. Swanson and Allara both said they made quick decisions about what was appropriate, and said their main goal was to ensure the children felt secure. "I was told later that many teachers were asked to turn their televisions off and to allow parents to discuss the day’s events with their children," Allara said. "Our community is surrounded by chemical plants, so many families were scared of similar attacks closer to home and kept their children from school for many days." Since 9/11 occurred during a school day, teachers say they often face an onslaught of emotions when they give lessons on the attacks from the same classrooms they were in 10 years ago. Sarah Roeske was teaching at Mountain View High School in Stafford, Va., 45 minutes south of the Pentagon. "Being in the classroom was very tough, because it was so emotional, especially where we live," she said. "In the beginning, it was shock, such a sense of vulnerability, that my generation had not felt. So much of it was emotional," Roeske said. "In the years since, it has become a little easier to teach just because we've had a little bit of distance, we can turn more toward curricular issues." While teachers say their own 9/11-related emotions still hold strong, they note they are increasingly dealing with students who have no recollection of the day. Many of Roeske's students have relatives who served in Iraq or Afghanistan. She often opens her Sept. 11 unit by asking her students about the causes of the attack -- and every year, she is stunned when most don't know. "There is a lot of practical stuff that has to be taught because they were so young," she said. Additional Reporting by HuffPost's Joy Resmovits.